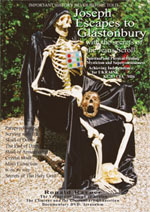 I used Wilson the skeleton in my latest book, ‘Joseph Escapes to Glastonbury’ (www.josephescapes.com). We dressed Wilson with a Urim and Thummin for my experiment in parapsychology, scrying in the manner of the High Priests in the Temple of Solomon. A natural follow through from my experiments in my previous book in the series, ‘The Voyages of Joseph of Avalon’, (www.josephofavalon.com). In that book I scry, using a crystal skull, crystal wand, and crystal ball in the manner of the Druid High Priests at the Druid Cor at Glastonbury. We have owned Wilson for seventeen years, and for his birthday this year we bought Wilson a present of a Monkey God, from Malaysia. I, personally, have found Wilson to be good company. When the family are busy, and I am eating on my own, I sit Wilson at the dining table, and I never feel alone. Wilson’s toys are also fascinating and entertaining. Quite often when I am writing my next book, or a script for a documentary or film, I may look up at the Monkey God, or one of Wilsons other toys to rest my eyes. The Monkey God never looks scary because he has a rather soppy face, full of mischief. Last year my youngest son Craig, who makes the sculptures in our books, gave Wilson an ancient Shaman Spirit Doll for his birthday. The doll has a really happy face and a really great hair style. We are still struggling to come up with a suitable name, but for the present we have named him Mr Spooky. Shaman Spirit Dolls were used in the West of England from B.C to A.D. for warding off evil spirits, or casting out evil spirits from humans into animals. Last Christmas, Craig bought Wilson his own Witch Doctor mask, which we have named GP. Writing continuously can be very tiring. If I feel the need for a break I sit and design a house to fit on a specific plot size, which can take all day. Our family needs change every few years, so we start building. Fortunately, I have the knowledge and experience to produce a really good result. Some years ago I won a European Award for a house in my book of Tudor House design, which was good for my vanity. I designed all the houses in the road in which we live, sited in a pretty Village in Essex. Thanks to my designs, the houses in the road are now the most expensive in the Village. Sometimes I will wander off to look at Craig’s latest sculpture. At the moment he is working on an Armageddon piece. Sylvia is sitting staring at the sculpture, while writing poetry. We sometimes relax by having a bit of fun when Wilson is sitting with us over a light lunch at the dining table. Craig will fit Wilson with a Mask, and we will all wear masks, staring at each other to experience changed perception in time and space. The session usually ends in hysterics, with a cup of black coffee and a homemade biscuit. Sylvia makes our own biscuits so that we can stamp them from a set of ancient Tibetan wooden stamps with various prayers or blessings carved into them. We close our eyes when choosing a biscuit, in anticipation of what the biscuit may say. If we can’t interpret the symbol, we invent something, which is usually the cue for another round of hysterics. After which it’s back to writing, taking photographs, discussing a script for a documentary, or driving off somewhere to gain some walking exercise. Usually Cressing Temple Barns, The oldest Templar Barns in the world, administered by Essex County Council, Parks Department, where there is always a friendly and polite reception from the staff, who are usually entertaining school children, and teaching them about history. In my last book, ‘The Voyages of Joseph of Avalon’, (www.josephofavalon.com), the experiment in parapsychology involved scrying in the Manner of Druid High Priests, as practiced at the Druid Cor in Glastonbury, two thousand years in the past. This involved using a real crystal skull, a crystal wand, and a crystal ball. I sat in a chair set in the centre of my garden, facing the setting sun. I then offer the crystals in turn to the North, South, East and West. I held each item in turn, and drifted off into trance meditation, clutching a pen and paper to write down everything I saw. The whole experiment was really interesting, enjoyable, and good fun, until I noticed smoke coming up between my legs from the cushion on the chair. The sun focused through the crystal, burning a narrow hole in the cushion, missing my private parts by an inch. As to the results from the scrying, they were scary. However, I always give a health warning; that these experiments should be looked upon as entertainment only. 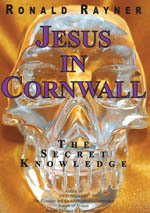 In my latest book, ‘Joseph Escapes to Glastonbury’ (www.josephescapes.com), I continue my experiments in parapsychology; Scrying in the manner of the High Priests in the Temple of Solomon. This necessitated Craig Rayner making a Urim and Thummin, comprising twelve precious and semi precious stones, details of which are in most copies of the Bible. Craig acquired the genuine stones in order to make the experiment as authentic as possible. 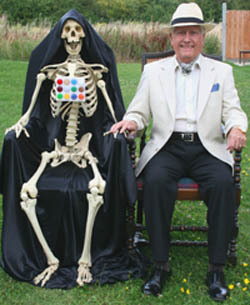 The stones were set in plastic boxes and fixed to a padded breastplate, which Craig tied to Wilson the Skeleton’s chest. Wilson sat with us at the dining table in the afternoon for a strawberry tea, to set the mood. After which we took Wilson into the garden and sat him on a chair, side by side with myself so that I could hold his hand to set up communication. In my pocket was a piece of Calvary from the Altar of Crucifixion in the Holy Sepulchre, Jerusalem, given to me by Sister Katarina who attended the Altar, when we were making our Documentary DVD ‘Jerusalem’. It was ironic that Katarina told me that now I possessed the white stone I would be able to read the Urim and Thummin. I said my prayer for protection, and holding Wilsons hand I went into trance meditation, asking to see the future for the planet, recording accurately what I saw. I found myself in space looking down on planet earth, and what I saw was not good. Instead of enjoying the experiment as I had anticipated, it took me a while to emerge completely from the trance, and I experienced a feeling of fear. I put that down to going too far back in time. Nevertheless, I recorded faithfully what I saw, but it is not an experiment I care to repeat. Scrying is, however, more interesting than some of my other experiments in my field of interests. I used the ‘I Cheng’, for example; a Chinese work of divination from the twelfth century, casting the yarrow sticks, and looking up the pattern in the I Cheng book for the answers to questions. I kept the record faithfully over a period of two years, keeping the book above shoulder height, wrapped in a black cloth. Sad to say, the answers to questions from casting the Yarrow Sticks were no more accurate than spinning a coin, exactly fifty- fifty. Scrying is just a small part of the book, and mainly for fun. 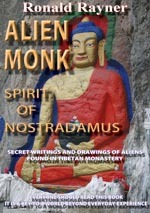 The main thrust of the book is fascinating, and gripping. A story, never before told, about our involvement in bringing about the Independence of Ukraine from the Soviet Union, and the way those activities led to the rediscovery of the ‘Jesus Scroll’, which, Quoting my wife Sylvia, “the most important discovery, since the discovery of the Dead Sea Scrolls”. It records conversations with Jesus covering subjects such as Mysticism, Spiritual Healing, and more. How the great Uncle of Jesus, Joseph of Arimathea, was the brains and money behind the Disciples of Jesus. The true history of Mary Magdalene, and her absolute importance in the story of Jesus. How the Holy Grail came to England. All the dangers we faced recording the details, from the translation of the Jesus Scroll.